If you’re fancying escaping the harsh winter with a lush tropical cruise getaway, we have some good news: prices for many cruises in January 2019 are significantly lower than they were a year ago. However, there are major differences by cruise line. 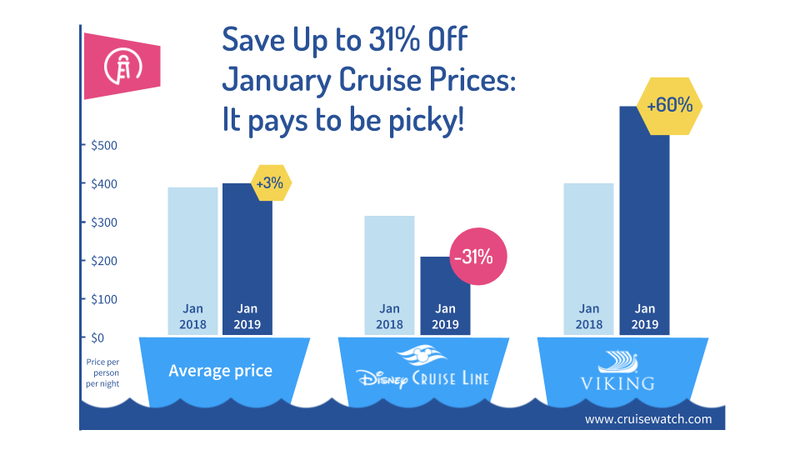 While our analysis found that the average cruise price per day only differs by 3%, and actually increased from $397 to $407, it also showed substantial price discounts for certain cruise lines. If you’re still searching for the perfect family cruise that won’t break the bank, our findings will be music to your ears. Disney Cruise Line is among the cruise lines offering cabins at significantly cheaper rates as compared to the same time last year. Whereas a customer had to pay $317 per day for a January 2018 cruise if booked by late November 2017, for the same period one year later there are cabins available at $220 per day - a whopping 31% less! Some luxury lines are also offering significant savings compared to January 2018. Regent Seven Seas is offering sailings for just shy of 30% off last year’s prices, while even Seabourn offers 25% lower prices than the same time last year. Let us help you find your perfect cruise! We are your digital cruise advisor monitoring cruise prices for you, and we’ve analyzed more than 13 million data points for this research. This particular analysis looked at cruise pricing on November 25, 2018, and compared it with the same view of November 25, 2017, comparing the average cheapest cabin available across all sailings by cruise line for departures in January. Ready to make your dream cruise a reality? We want to help! Our goal is to help you find the right cruise for you at the right time, for the right price.